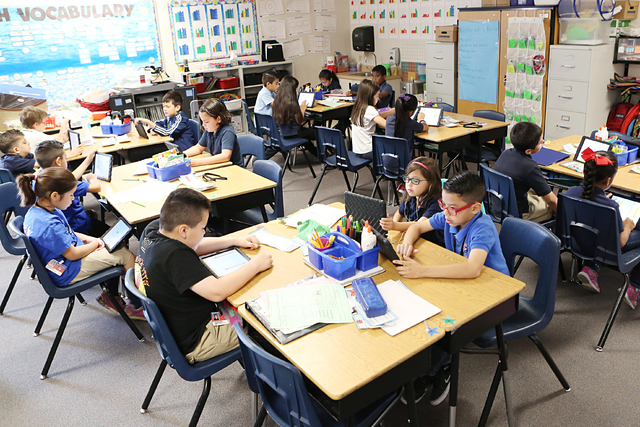 The Clark County School Board Wednesday approved a $2.2 billion budget that includes larger class sizes and fewer year-round schools but expands full-day kindergarten to all elementary campuses. 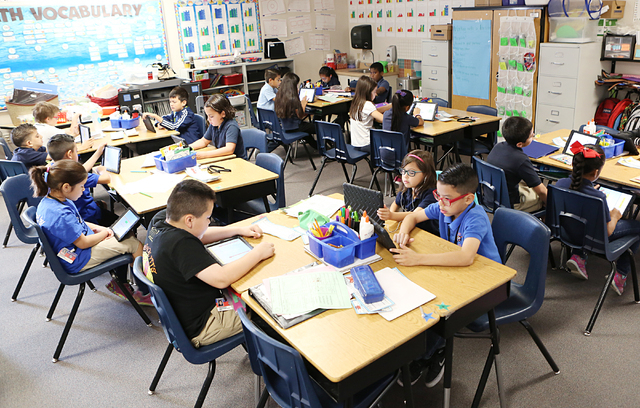 The Clark County School District will pack even more students into classrooms next year as it attempts to trim millions of dollars from a 2016-17 budget that balances lower-than-expected enrollment growth and a virtual freeze in property tax collections. 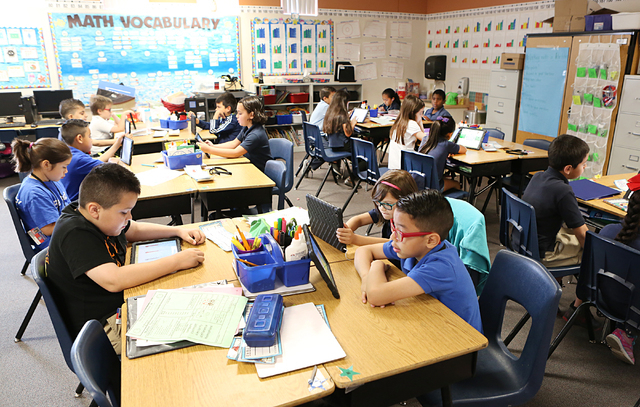 By unanimous vote Wednesday, the Clark County School Board approved a preliminary $2.2 billion budget for the next academic year that includes larger class sizes and fewer year-round schools but expands full-day kindergarten to all elementary campuses. Spending would fall $13.9 million short of this year’s plan, despite an increase in per-student state funding. District officials already had increased class sizes at the secondary level this year. The current student/teacher ratio is 32-to-1 in fourth and fifth grades; 34.5-to-1 in middle school; and 34-to-1 in high school. Those ratios now will rise by one student in grades four and five at underperforming elementary schools; by one in all grades at other elementary schools; and by 1.5 at middle and high schools. “This is the last thing we ever want to do,” said Linda Young, president of the school board. Other cuts include reducing the number of year-round schools from the current 22 to 15 and closing a continuation school for expelled students. Overall, the district next year will bank nearly $2.3 billion in state and local revenue, about $7.6 million less than the current year largely because of flat student enrollment and and property tax collections. The district had projected enrollment to hit 323,000 this year, but now expects about 3,300 fewer students in 2015-16, meaning the district won’t receive more than $18.4 million it expected in state funding. Enrollment likely also won’t grow next year. A recent expansion in charter schools may have impacted enrollment, said Jim McIntosh, chief financial officer for the district. The budget includes a $57 million cash reserve, meeting a self-imposed requirement of holding at least 2 percent of all revenues in reserve. New spending priorities include $11.8 million to hire staff because of continued growth in special education students, $2.7 million for four new magnet schools and $52.5 million in teacher pay raises. However, the 2016-17 spending plan includes no estimate for how much it will cost to close contract negotiations with its four remaining employee groups. “Proposals have been made, and we are in negotiations. That’s really all I can say,” said McIntosh, who would not cite dollar figures for the contract proposals. Separate from its general fund, the district next year will spend $401 million to build 12 schools in growing neighborhoods, make 43 additions at crowded campuses and replace aging facilities. The school board Wednesday also approved revisions to its 1998 and 2015 capital improvement plans. A 6-1 vote funneled $9 million from a 1998 plan “major building system failure” fund to build a new gym at Virgin Valley High School in Mesquite. District G Trustee Erin Cranor was the sole “no” vote, and later questioned spending priorities in the 2015 plan, which provides less than $1.1 billion for school modernization and renovation — far less than the $4.7 billion district officials say is needed to keep its rapidly aging schools in shape. “The potential for actual learning time being interrupted is really weighing on me,” Cranor said.